Don’t let the unpronouncability of the poet’s name throw you off–this collection is worth looking into. This wonderful book came to us in the mail from those nice folks at Zephyr Press, who no doubt were pleased by the fact that this collection–in parallel translation–was shortlisted for best poetry translation of 2009. It appears to be the third in Zephyr’s New Polish Writing series. I’m certainly looking forward to their future publications. The poems in this collection are spare, sinewy, and often disturbing in their sense of detachedness, both in a sense of remove as with a sense of having been, with a shocking blow, been severed from important connections, from loved ones, lovers. 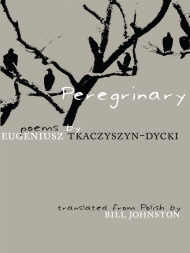 they are a selevtion from Tkaczyszyn-Dycki’s previously-unEnglished nine books of poetry, published beteen 1990 and 2005. This sense of loss is underscored by the obsessive revisitation, of circling back to the same issues, the same events, that the speaker still has yet to come to terms with. Bill Johnston, yet another greatly talented Indiana-based translator (see yesterday’s Gunter Grass post)–has done a great service in bringing this Polish poet to an English-speaking audience.